This 200-seat chapel, located in a Jesuit high school in Chicago, anchors the institution both figuratively and literally. The east-facing chapel collects morning sunlight (when services are held) through its irregularly-patterned glass block walls, while a three story light monitor carved into the building brings light from above into the sanctuary. The wave-distorted glass block masonry on three sides serves to filter out visual and acoustic distractions from the busy urban street life immediately outside in order to internalize the spatial experience. 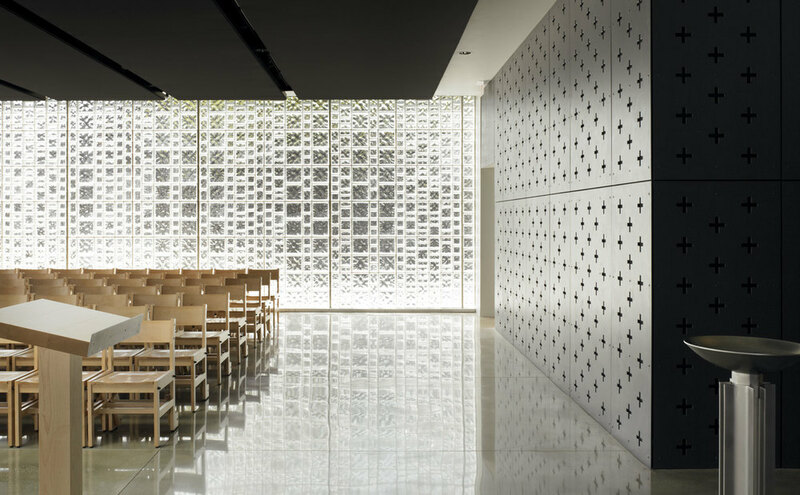 The highly polished concrete floor reflects and magnifies the light patterns created by the block, and fiber-reinforced panels with custom-milled cross-shaped cutouts on the fourth wall of the chapel are backed with sound insulation to provide acoustic absorption, along with the acoustic stretch-fabric ceiling. A custom-designed crucifix comprised of stainless steel cables lies on axis with the entrance, while architect-designed chancel furniture in birch wood (altar, candles, credence table, lectern), and stainless steel (holy water font), complement the space’s sensuous minimalism and serene spirituality. Lining the courtyard walls outside the chapel are custom designed cladding panels that depict the Stations of the Cross, a Christian religious service that commemorates the final hours of Christ.